These slippers are perfect for the beginning knitter. They are cozy and stylish and knit up in a snap! They are meant to knit up a little smaller than the foot, and stretch to fit, just like any good slipper would! I enjoyed this pattern after some modifications were made. I shortened the height of the waistband and the skirt length. I also changed the shape of the skirt slightly and cut it in one big length on a curve instead of three pieces. I also made the side seams larger to ensure a more form fitting bodice. These knitted up quickly. Sewing them together was a little confusing, but after studying the pictures I was able to figure it out. I was able to make these in such a short time. They fit perfectly. These were easy to finish and very cute. 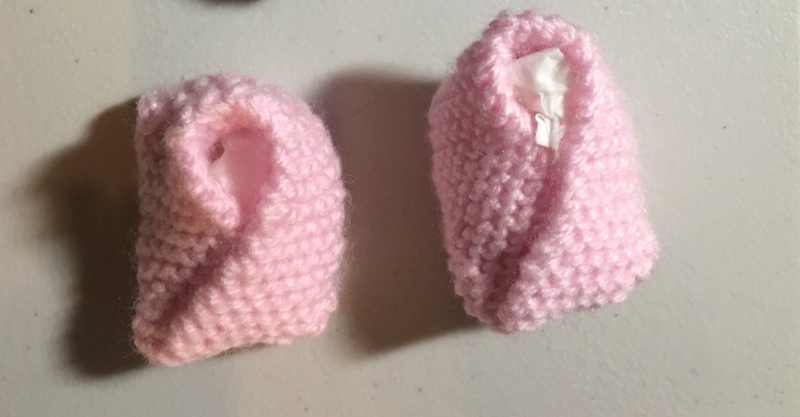 My grand girls will love them! i love our patterns. the are modern, lovely, verry lovely.